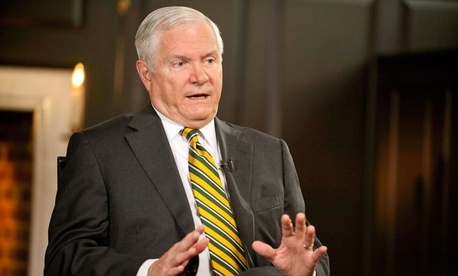 Former Defense Secretary Robert Gates' memoir is 640 pages long. And at least some of those pages aren't filled with warm reflections of a career well-spent. Gates does not have kind words for his former boss, Barack Obama. "The president doesn't trust his commander," Gates writes in Duty: Memoirs of a Secretary at War, out next week, reflecting on a March 2011 meeting on Afghan policy. Obama "can't stand [Afghan President Hamid] Karzai, doesn't believe in his own strategy and doesn't consider the war to be his. For him, it's all about getting out." Gates does not have kind words for his former colleague, Vice President Joe Biden. The vice president is "a man of integrity," Gates writes, but he's been "wrong on nearly every major foreign policy and national security issue over the past four decades." "Hillary told the president that her opposition to the  surge in Iraq had been political because she was facing him in the Iowa primary.... The president conceded vaguely that opposition to the Iraq surge had been political. To hear the two of them making these admissions, and in front of me, was as surprising as it was dismaying." "I found her smart, idealistic but pragmatic, tough-minded, indefatigable, funny, a very valuable colleague, and a superb representative of the United States all over the world." Gates does not have kind words for two other former colleagues, Thomas Donilon or then-Lt. Gen. Douglas E. Lute. They were "aggressive, suspicious, and sometimes condescending and insulting" toward military leaders. He describes how he came to feel "an overwhelming sense of personal responsibility" for the troops he ordered into combat, which left him misty-eyed when discussing their sacrifices—and perhaps clouded his judgment when coldhearted national security interests were at stake. There may be more words where those came from. From the excerpts in The Washington Post and New York Times, the memoir appears to be a rare, rich look into how the George W. Bush and Obama administrations conducted wars in Iraq and Afghanistan, with no hits spared for anyone involved. Gates, The Post's Bob Woodward points out, has served every president since Richard Nixon, Bill Clinton aside. This isn't just pointed criticism coming from a hack, or someone who has a particular partisan bone to pick. It's coming from a guy who knows government, knows military, and knows war better than nearly anyone else on the semipolitical scene. Even if you don't agree with every strategic decision the guy's ever made, it's hard not to take his critiques of how the Obama administration is run seriously. Gates' version of why Clinton opposed the surge fits perfectly into this existing good-politics-makes-good-policy narrative about the former Secretary of State. And that's what makes it dangerous for her -- and why you can be sure she (or her people) will (and must) dispute Gates' recollection quickly and definitively.